Community college faculty face the largest teaching loads in higher education. And most do it without an expectation of doing research at the same time. At CUNY, community college faculty, tenured and tenure-track, are expected to do research while holding a 27 credit annual teaching load. So the University has had to find ways to support community college research. As part of their collective bargaining agreement, tenure track faculty have 24 hours of reassigned time available to use for research in their first five years. After that, faculty are able to pursue CUNY-wide and outside funding, which is highly competitive, to support their research. 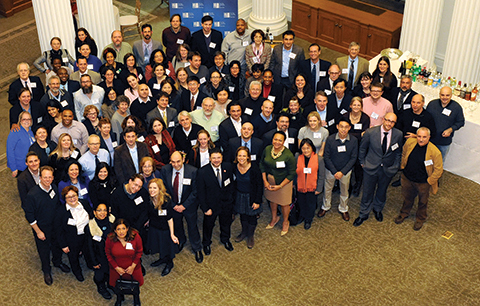 Faculty researchers at the CUNY Salute to Scholars, 2014. At the college level, BMCC has several opportunities for funding research costs, some that include reassigned time, through small grant programs. The Faculty Development Committee of the Academic Senate sponsors its award. That deadline just past. The Office of Academic Affairs also make available the Faculty Publication Grant to support tenured faculty members in bringing well-developed projects to fruition, including peer reviewed scholarly manuscripts and creative work. This grant award requires that projects will be completed and submitted to a refereed scholarly venue by the end of the funding period. A new opportunity was initiated this year to support for Interdisciplinary Projects related to student learning, pedagogy, or research. Awards of up to $2000 will be made for projects that involve two or more faculty from different disciplines that result in 1) new applications of high impact teaching practices; 2) new pilot research, scholarly inquiry studies, or creative works; or 3) scholarship of teaching and learning. The submission process for both projects is now open. April 27, 2017 April 3, 2017 – Deadline for completed applications received by the Office of Academic Affairs. May 15, 2017 April 26, 2017 – Notification of grant awards. January 31, 2018 – Midterm status report of grant awards in progress due. June 28, 2018 – Submission of final report of grant awards. This entry was posted in faculty, interdisciplinary, research and tagged award, faculty, grant, research. Bookmark the permalink.